The number of future applications of graphene is almost going to be infinite. Graphene is a nano-sized wonder material with a massive future in the world of electronics. With its unique properties the material is effective almost in all areas of science. Ever since its discovery in 2004, graphene has been hailed as a natural speculate destined to transform the way we live in the 21st century. The amazing properties of graphene excite and mystify in equal measure. One of the very first applications of graphene is probably going to be as a replacement for metals that are relatively expensive such as indium selenide in solar cells. Graphene is a perfect replacement, because of its special properties. Being the best conductor of electricity known today and its super thin thickness it will be the most effective material to replace such metals currently used in solar cells. With graphene we are going to see a new array of communication devices that also uses other two dimensional materials alongside graphene. Products such as mobile phones are going to be integrated into stuff like paper, clothes, and in windows. This means an absolute change and flexibility in the way we communicate. With a thin material like graphene which is also ecologically friendly since it is made of carbon, we can’t help but contemplate of wearable technologies. Another area that is going to be transformed in the near future with graphene is transparent displays. It is going to be quite easy to have transparent electronic displays embedded everywhere. Depending on desire and design you can have the transparent electronic displays in walls, windows, glasses, and even in our floors. We need a transparent material to do all this and graphene is probably the only material currently known to man that is very thin and transparent. 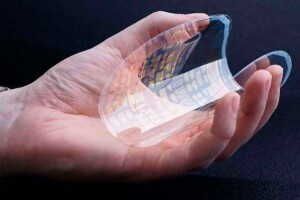 Depending on the specific applications we are likely to see graphene products soon. Use of graphene in transparent displays and in solar cells is going to be in the marketplace in a couple of years.